£149 per person which includes lunch and refreshments. ​Bill will demonstrate how to develop a basic film literacy for you and your students, which will take you from simply 'watching' films to 'reading' films. He will also take you on a tour of some free resources which will transform your classroom into a magical place of learning and discovery. ​​Rob’s sessions will demonstrate how to embed a range of short films and animations into existing units of work as well as how to create units around quality moving image. Films can be used as inspirational writing stimuli but that is not all that it is useful for. Rob will show how film can be used to improve confidence and enhance reading skills. 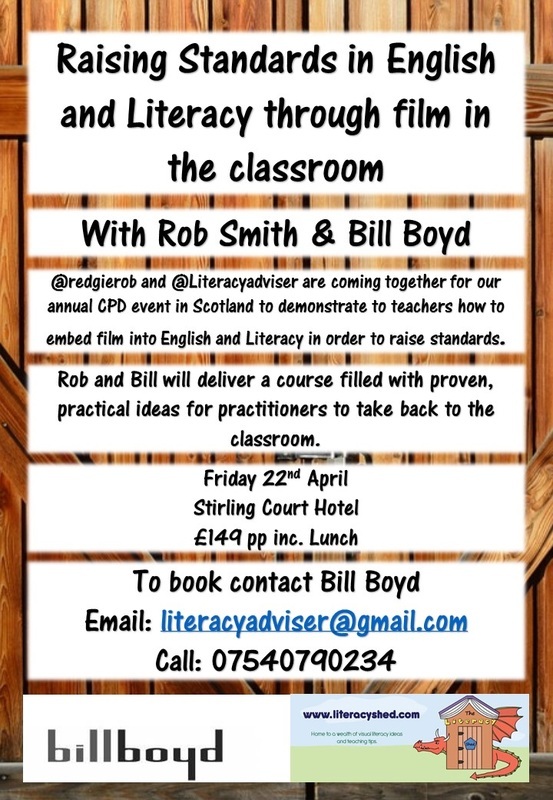 ​Bill is an independent literacy consultant with considerable educational experience in Scotland. He began his career as a secondary English teacher, and was Head of Department in two separate schools before becoming a Depute Headteacher in a large secondary school. Seconded to Learning and Teaching Scotland (now Education Scotland), the national advisory body on the curriculum, he was a Programme Manager during the development of Curriculum for Excellence. He worked with the Scottish Qualifications Authority as an adviser on the development of literacy tasks for the Scottish Survey of Literacy and Numeracy, and has written and reviewed a number of film resources for Into Film, Scotland on Screen, Screening Shorts and Moving Image Education. ​​Rob has been teaching in Primary schools for almost 10 years and he is currently touring the world delivering film & literacy CPD and writing workshops. Rob's teaching and the search for innovative methods led him to use videos to inspire writing. The first animation he used with children was 'The Piano,' after this both he and the children were hooked. He began blogging his ideas and experiences with image and short film. The blog soon developed into The Literacy Shed, somewhere to escape to and share ideas. Since going live in June 2012 the Literacy Shed has had over 3 million users and won a number of awards including The Edublog award for Best Edtech site. Rob has written for a number of publications including ‘Beyond Early Writing’ from Critical Publishing.